Every time I look out of our hotel room at Bellagio, Italy I’m amazed at the beauty of the area. From our balcony we see a large expanse of blue lake, guarded by mountains across the water, and several small villages nestled along the shoreline. 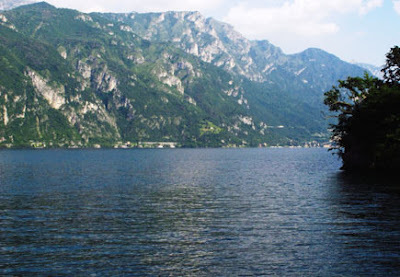 We walk uphill to Punta Spartivento, “point where wind divides,” as it marks the conjunction of three lakes—Lecco branch is southeast, Como branch is southwest, and Colico branch is straight ahead. This distinctive spot stands in my memory as a highlight of Bellagio because it affords exceptional views of Lake Como splitting and flowing in three directions. To see how the super-rich spend their vacations, we walk to the entrance of Grand Hotel Villa Serbelloni, originally a private villa when it was built in 1852. Today the hotel is owned by the Rockefeller Foundation of New York. 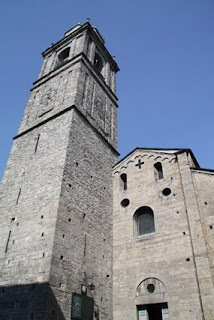 In the upper part of town is the church square where we first parked, the Piazza San Giacomo. St. James Basilica is located there. Built at the end of the 11th century, it was decreed a National Monument in 1904. A granite fountain in the middle of the square was created in 1897 to celebrate the 60th anniversary of Queen Victoria’s reign. The statue of Madonna on top was added in 1947. Streets are very narrow and lined with shops where tourist are filling up their bags. Hungarian musician and composer Franz Liszt arrived in Bellagio in the summer of 1837 with his lover Madame d’Agoult. No one recognized him, and he appreciated the solitude—until a friend decided to sell one of Liszt’s compositions. After people realized he was here, his service improved noticeably. 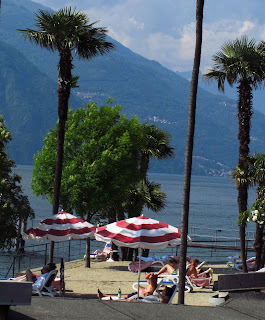 Liszt loved Lake Como and thought it a superb place for people in love. Mark Twain came with friends in 1867. A page of his book Innocents Abroad describes the hotel we’re staying in. He tells of days wandering, admiring the Alps, and of evenings playing billards, dining, and smoking on the porch overlooking the lake. Right beside Hotel Metropole, where we're staying, is the “borgo,” Bellagio’s historic center and one of the first areas in the town to be inhabited and developed. The Tourist Office in Piazza Mazzini is located here, so you can easily book excursions including boat rides on the lake. Many shops, cafes, and galleries also cater to visitors. It doesn’t take long to feel the romantic ambience and unique character of the town. The tempo of life is slower here. Tourists—even Americans—seem to stroll rather than power-walk. We don’t see anyone jogging on the streets. Bellagio is a great place to relax and recharge, especially with a favorite person. After just one night there, the spirit of the town captures our imaginations. It’s one of those rare places I could return to in a heartbeat. Read more travel stories at Striped Pot. I fell in love with Bellagio, too. I love how small and walkable it is. Irene, it's an easy place to love once you've actually been there and experienced its beauty and charm.